Paul Di Filippo. The Secret Sutras of Sally Strumpet. 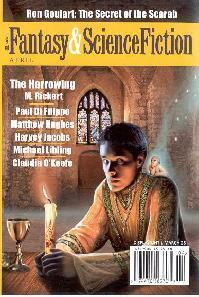 Similar in style to PDF’s humourous “The Short Ashy Afterlife of Hiram P. Dottle” from F&SF May 2002, so if you read that and enjoyed it, you’ll like this. A struggling author has hit upon a rich seam – however, he has mined that seam in the guise of Sally Strumpet, a female writer of a chick-lit novel. When it comes to publicising the book, what to do? Own up to the pseudonymous nature of the novel (and probably lose all his sales), or something else? Something else, he and his agent decide, and they audition actresses for the larger than life role of Sally Strumpet. They find someone perfect for the role – too perfect in fact, as she insists that she is Sally Strumpet. As if this isn’t bad enough, the author’s world unravels as the world gradually changes to accomodate her world view, leaving him in a very precarious predicament. Can he regain his rightful place? Not Di Filippo at his absolute best, but there are some good touches in what is really an extended Pluamge from Pegasus riff. A dark tale of obsession. Ryan Ceres is a real-estate developer, a rich, not particularly nice, real-estate developer. He happens upon a disused factory in a very unsalubrious neighbourhood, and against all common sense, decides to transform the derelict building into a high-class condo. Not only does he not have common sense on his side, he has the property itself very much set against his plans, and the property assumes a human guise to persuade him of the error of his ways. Hobson flags up the ending at the beginning, but smoothly runs thourgh Ceres’ downfall. Ron Goulart. The Secret of the Scarab. Further comic adventures of Harry Challenge, which will please those who have enjoyed his previous appearances in F&SF. A short, intense piece. Caroline is driving through the woods, with her ex-husband, trying, in vain, to recapture a magic moment from the past.A fleeting glimpse of a herd of black deer has stuck in her memory, and it is now a touchstone for her past. But, as we know, and as she finds out, the past is indeed a foreign country. Harvey Jacobs. A Friendly Little Oasis. Kovacho the vampire stops off in a small little town, to quench his thirst. The populace are a funny bunch, each and every one stopping to offer varying but insistent advice on the nature of, and treatment theoreof, that red stain on his collar. Michael Libling. The Gospel of Nate. Nate is down on his luck, working the night shift in an emporium which enables individuals to hook themselves up to their past lives. He has been remarkably unsuccessful in identifying -any- past lives, whereas others find a rich seam of previous incarnations. One such is Sam (Nate is attracted to girls with men’s names – paging Mr Freud!). On her first visit she claims to have previously been a whole host of spiritual leaders – Jesus, Moses, Buddha, Mohammed. This is bad enough, but on further visits she also claims to have been previously several fictional characters. This is not a distinction I personally would share Libling’s, which rather spoils the discussions between the two as to Sam’s true nature, and whether, as she suggests, she is in one of her regular appearances in which she is to be betrayed by another Judas. And indeed, it is Nate on whom this role falls. Further humorous happenings of Hengis Hapthorne, which will please those who have enjoyed previous appearances in F&SF. A young man, returning from time on the road to his family, meets a stranger on a railway platform. The stranger has a tale to tell, as is often the wont of strangers on railway platforms. The stranger relates how he, as a younger man, inadvertently contributed to the death of a fellow student, and of the nature of evil. The young man is affected by this tale, as is able to return to a straighter path than the one he has been following. Fine as far as these ‘stranger on a train’ (or in this case, platform) stories tend to go. Lighter material from Di Filippo, Goulart, Jacobs and Hughes, balanced with darker, stronger fiction from Hobson, O’Keefe and Libling. For me, three humorous stories is one or two more than I would prefer to see in a single issue. And, similarly, two stories in ongoing series is one more than I’d prefer to see in a single issue.